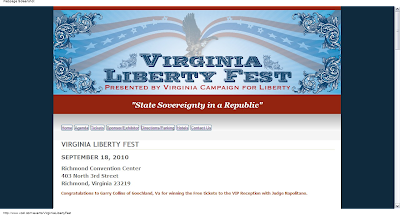 Virginia Liberty Fest will highlight a forum on "State Sovereignty in a Republic" with Judge Napolitano and other special guests. With unconstitutional power grabs such as ObamaCare opening more Americans to our message and causing them to take action, we have an unprecedented opportunity to turn back the tide of statism as we work to defend state’s rights. Make no mistake about it, we can win this grassroots 10th Amendment Revolution.